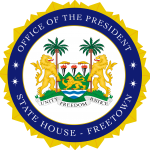 State House, Freetown, Tuesday, June 12th, 2018 – The newly appointed Attorney-General and Minister of Justice Dr. Priscilla Schwartz has today subscribed to the oath of office at State House following her appointment on Monday 11th June 2018 by His Excellency President Julius Maada Bio. Shortly after taking the oath, Madam Schwartz thanked President Bio for appointing her into her new office. She said the new direction represents the change which she is determined to move forward. The new Minister of Justice pledged her commitment to work in accordance with the vision of President Bio. Dr. Schwartz is a Doctor of Laws and the only woman to achieve such an academic feat so far in the country. She brings into the new office wealth of academic and professional experience both local and international. Until her appointment, she worked as a Senior Lecturer and Director of the Energy and Natural Resources Law (Masters of Laws LLM) Programme at the College of Professional Services, Royal Docks School of Business and Law in the United Kingdom (2007-2012); Queen Mary, University of London, United Kingdom (2008-2011); School of Oriental and African Studies, University of London, United Kingdom (2011-2013).